Karen Overbye will be exhibiting in the 2017 8th annual Member Musing Show at Grounds for Sculpture. Karen has exhibited five times in the Members Musing shows. This year's juror was Amie Postsic, Executive Director & Chief Curator at the Main Line Art Center in Haverford and Chair of Artistic advisory Board to the City of Philadelphia. 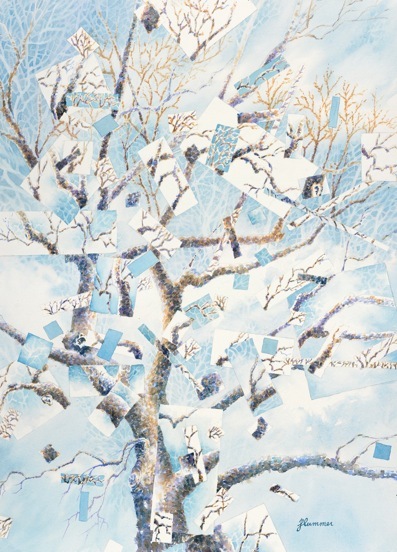 Karen's piece Blue Wave is a collage piece composed of acrylic skins. New labels will have to be made for Mill Pond Show. Mill Pond charges commission, and Hickory Corner does not have a fee. P. Hill will make new labels for pieces if you send her all the information of your work by April 26th- at the latest. A description of the Guild and works of members will be included in the Mill Pond show. 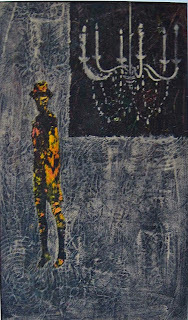 Ingrid Davis is a talented printmaker. 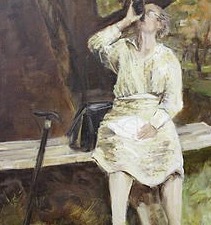 The techniques that she uses were developed in the 16th century but did not become popular until 19-20th centuries. She is one of the experts in this technique and we are excited that she will be giving us a talk about her work. This type of printing is described as white line wood cuts. The website below gives more information. This should be a fun evening. 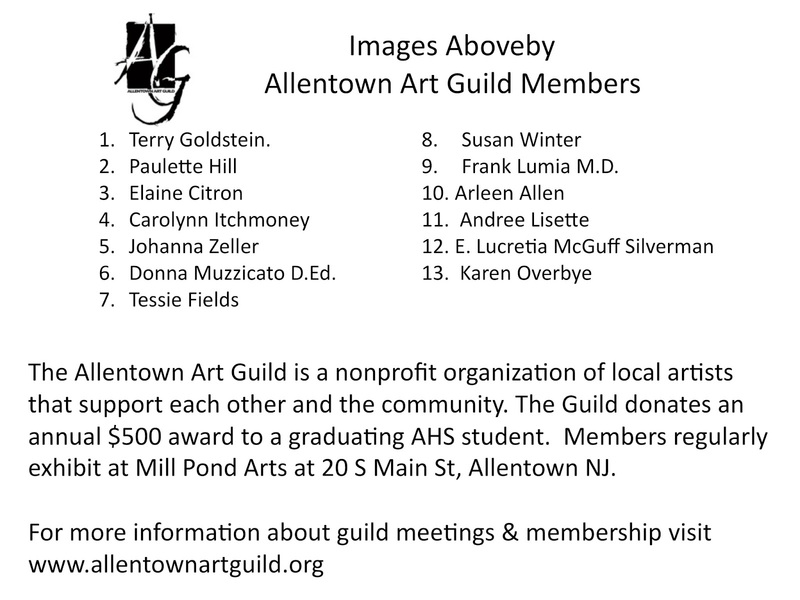 Art Guild will meet on February 16th 2016 but no demo will be given. 3. We are pleased to have guest speaker Donna Sertz. Donna Sertz is the owner of the "Branching Out" shop at 28 S. Main Street, Allentown NJ. This shop sells jewelry, home decor items, gifts, vintage items and original art. 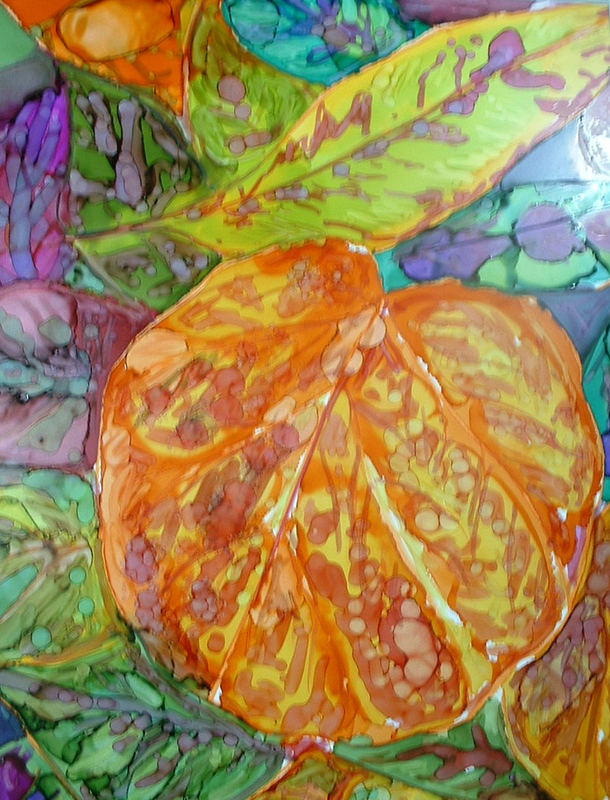 Donna offers various art classes such as but not limited to beading and polyclay. We are pleased to have Donna give a demonstration of her negative watercolor painting technique at this February meeting. Come out and enjoy the evening. 2. Group discussion how to improve sales- one or 2 days? 1 weekend or 2? AAG member, Terry Goldstein, will be showing his work at the East Windsor Library- at the Hickory Corner Branch in the months of July and August 2016. Have fun and support your fellow members-join them at the opening reception. Updates will be emailed to 8 members. Alcohol Ink Play - weather permitting! 1. Mill Pond now and next show-when does current show come down? 3. 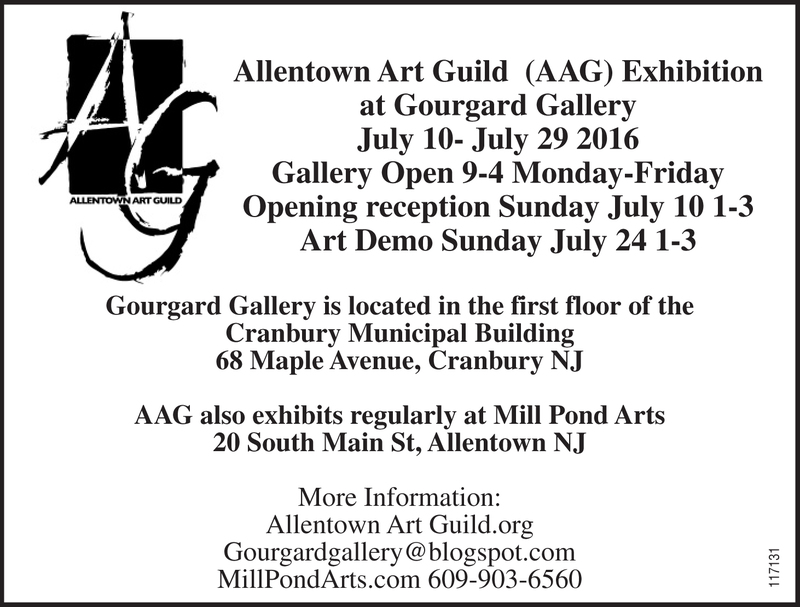 Gourgaud Gallery in July 2016- How many will be in show? 5. Cell phone camera 101. Bring your cell phones to meeting. 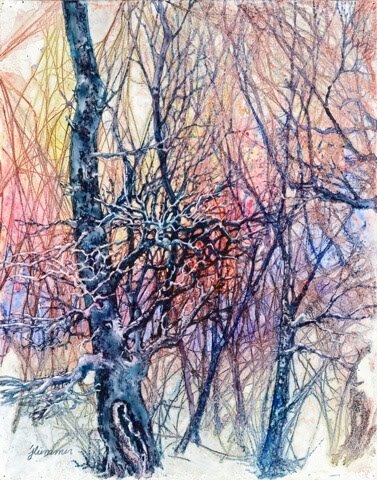 Last month Judith Hummer gave a wonderful demonstration of her watercolor technique using "spider webs" on Yupo. It was a fun evening. Please see the finished product that Judith made from the demo piece she made at our meeting. We are pleased to have Judith Hummer come to our monthly meeting. This meeting is free and open to the public. Pick - Up of Pieces at Mill Pond. 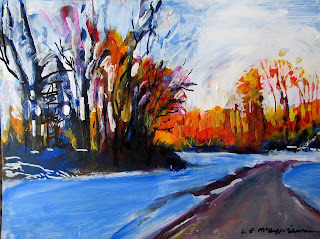 Art work currently at Mill Pond needs to be picked up January 26 3-7 PM or January 27th 10-3 PM. Try and pick it up on 26 we will be hanging next show on 27th. 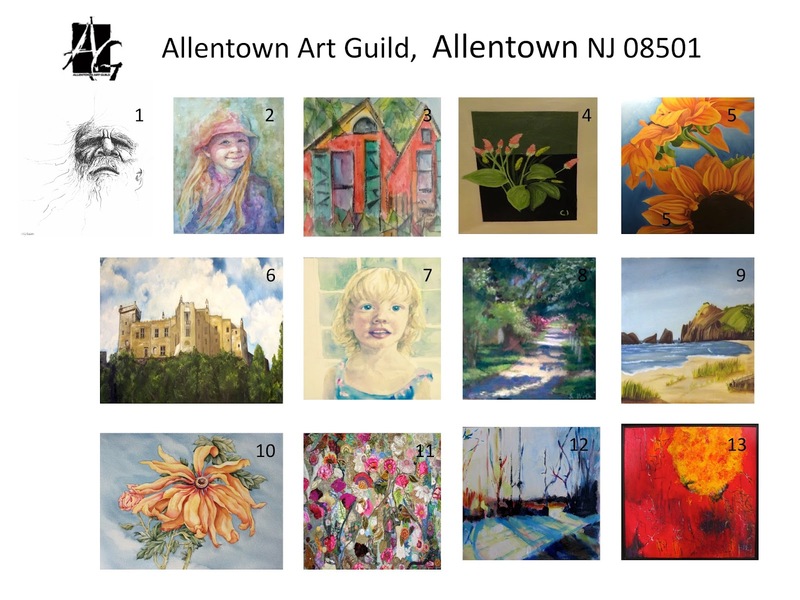 Please drop off your pieces on Dec 2nd 2-6 PM at 55 North Main Street, Allentown NJ. All pieces should be clearly labelled with your name, title and price. Check sign up sheet to see the hours you are scheduled to work for the holiday sale. Entrance fee is $10 for Mill Pond show. If you haven't paid for this show yet please bring a check to meeting on Nov 19th. 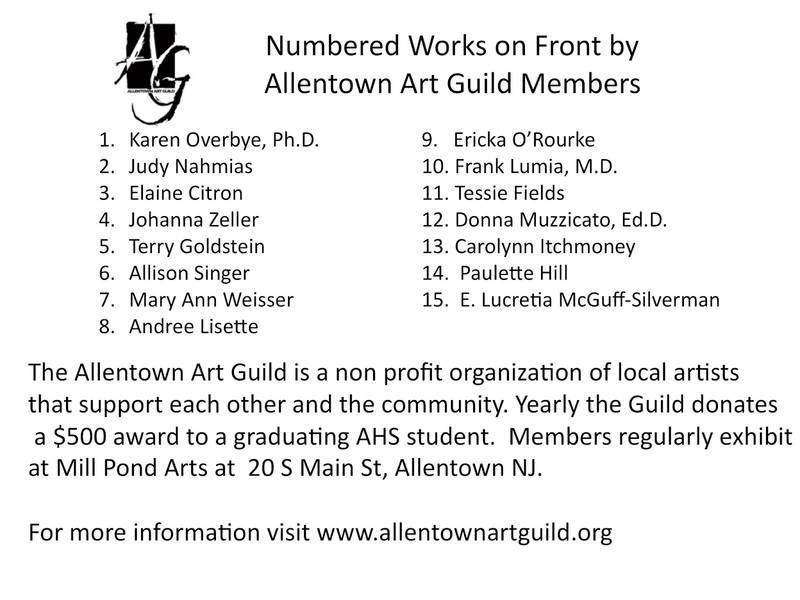 If you haven't paid for previous show please have a $10 check made out to Allentown Art Guild. To exhibit you have to be a current member. 7 Recycled pieces were left in new show. On bookcases ~10-14 small pieces. 2 Members still have not picked up their pieces. No fee to enter Holiday show but there will be a 20% commission on your sale. If you put pieces in the show you will have to sign up for working in the show at the next meeting Nov 19th. If you don't work and want your pieces in show you will be charged $10 service fee. There will be a sign up sheet at the monthly meeting. Sign up for 1 of the 2 days. We will need at least 2 people in the back of the house and 2 people in the front of the house for each day. Until we know how many will sign up- we can't determine if you need to stay for the full 5 hours. Holiday Pot Luck Party at 9 Stacey Drive on Friday Dec 18th 6PM. Members and spouses are welcome. A sign up sheet will be at meeting. Need to know head count and what you would like to bring. 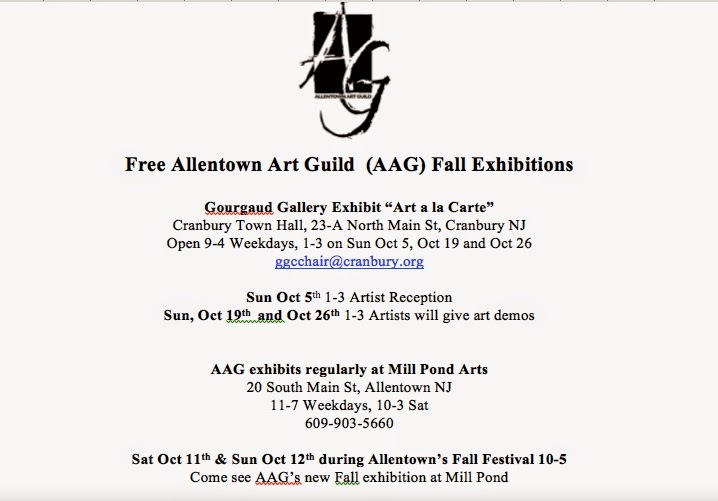 AAG members Andree Lisette aka Lisette Herz and E. Lucretsia McGuff Silverman aka Ellen will be participating in this Trenton Art All Day event. Lisette will be at 247 East State Street - first floor. Ellen will be at 228 East State Street. Lots of tours. Visit http://artworkstrenton.org/ for addition al data. 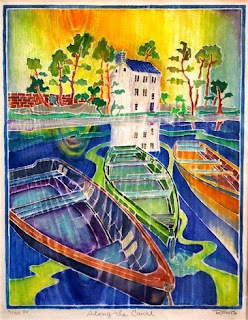 AAG member E. Lucrtia McGuff-Silverman will be one artists that will open her studios and work will be displayed at the Borough Hall for a pre-holiday show and sale. Start your tour with a Mural Talk at the Roosevelt Public School, learn about the Ben Shahn Mural that chronicles the founding of Roosevelt, and pick up a map of participating artists' studio locations. Karen Overbye will be exhibiting at the Art Alliance of Monmouth 9/30 to 10/28 at 50 Monmouth Ave, Red Bank, NJ. The hours of the gallery are 12-4 PM Tuesday through Saturday. Karen's piece "Controlled Chaos" is part of the show judged by Vicky Culver. It is a large, very colorful, in your face piece. Perfect for Orange is the New Black. Please bring your art pieces for Show and Tell! 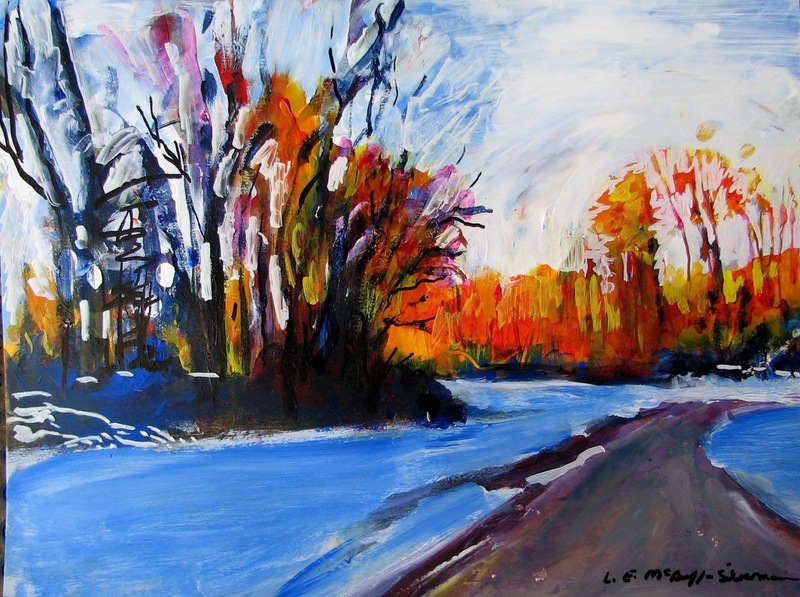 AAG member Ellen Silvermen aka Lucretsia E. McGuff Silverman will be exhibiting at several different locations. If you think you have been seeing Ellen's work all over the place it is true. Congratulations Ellen! You go Woman! 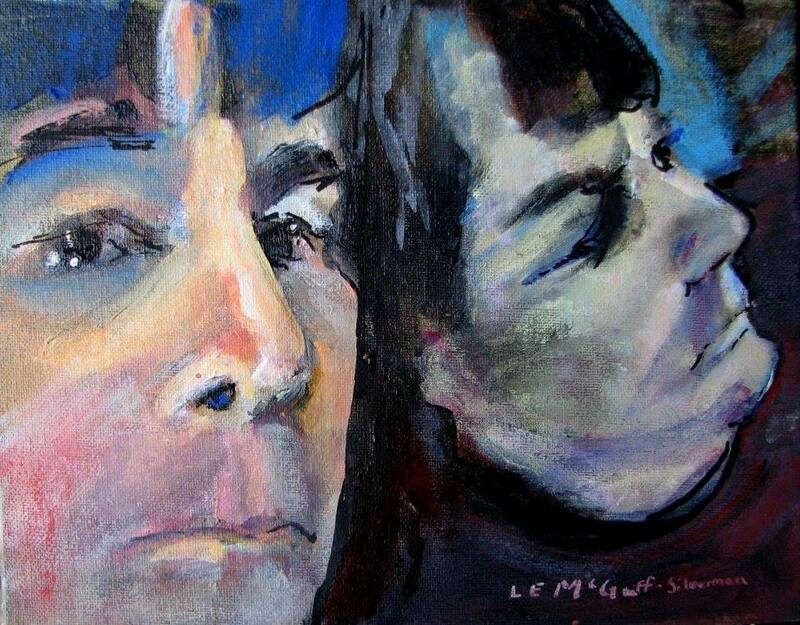 Ellen's self portrait is on exhibit at the Juried Portraits Show at Monmouth Museum Sept 18, 2015 though to Nov 1, 2015. 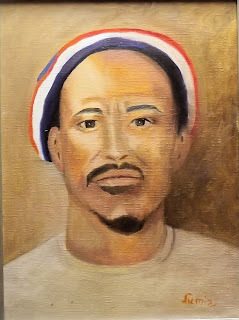 AAG members had a preview of this potrait at a recent meeting. The Monmouth Museum is closed on Mondays. Tuesday- Thursday 10 AM-5 PM, Fridays 10 AM-9 PM, Saturdays10 AM-5 PM and Sunday 12 noon - 5PM. This is an excellent show and also includes the work of former AAG member Jude Harzer and AAG speaker Karissa Harvey. 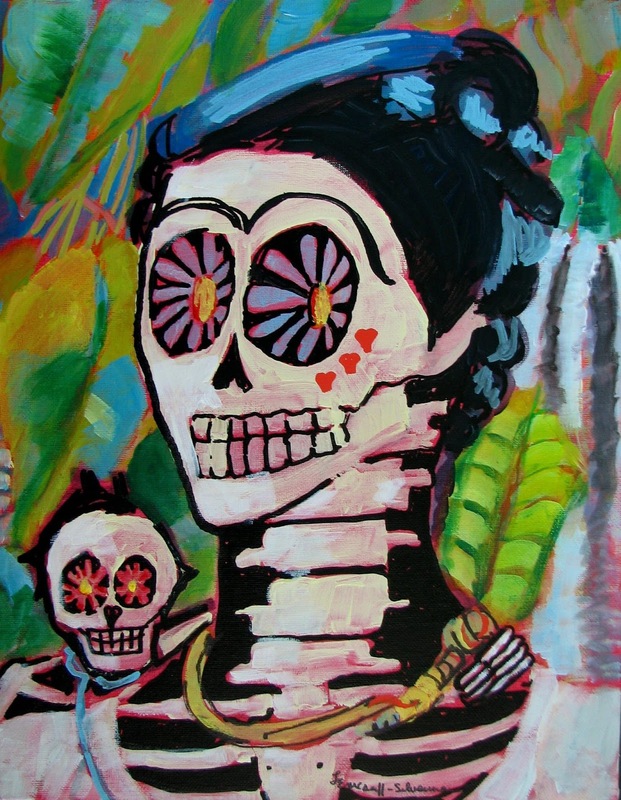 Ellen is also exhibitng at the Studio Montclair Show "Honoring the Fauves" SMI Gallery @ Academy Square SMA Viginia S. Block Gallery. First and second floors of the Academy Square Building at 33 Plymouth St, Montclair NJ. Gallery hours are Monday-Friday 7 AM to 7 PM. 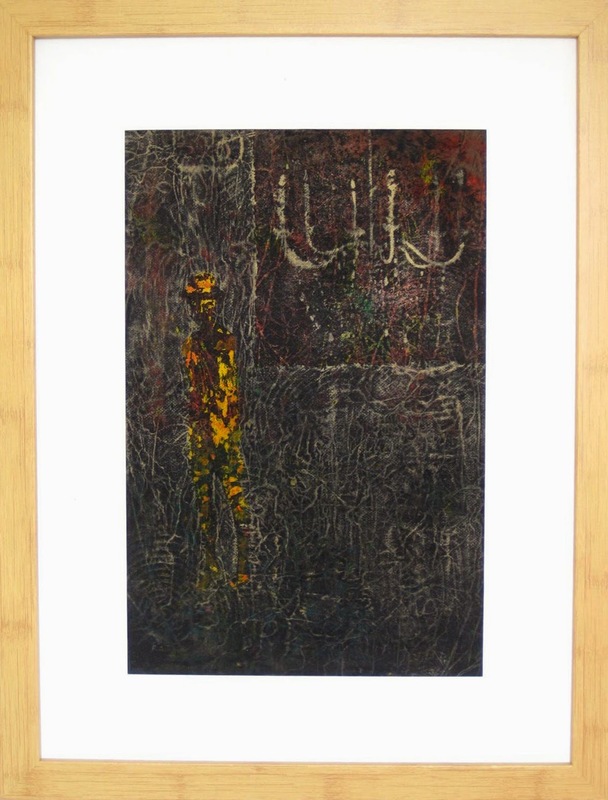 Below is one of 5 pieces on exhibit there. She currently has portaits of her parents in the West Windsor Arts Photo-Transformation Show. The show will be up Nov 7, 2015. West Windsor Arts , 952 Alexander Rd, West Windsor. The show is open Monday-Friday 10 AM- 6 PM, Saturday 10 AM- 4 PM. 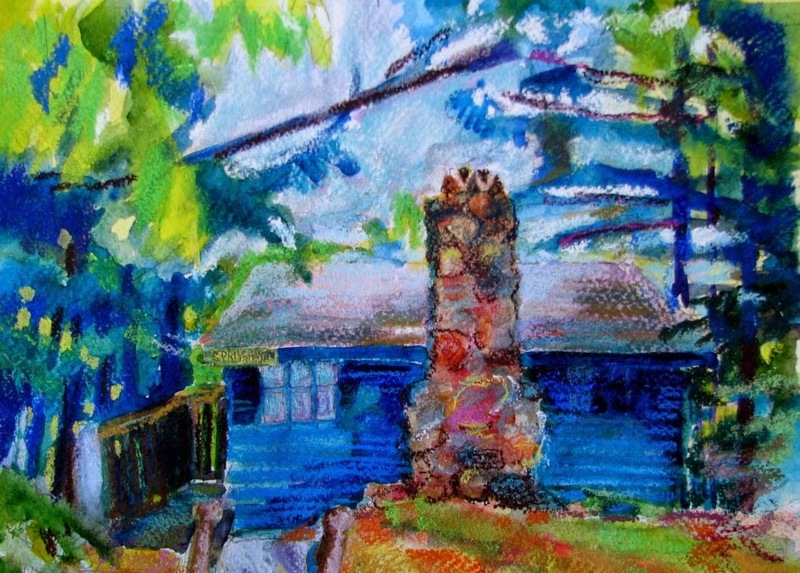 Ellen will have a piece in the stover Mill Gallery juried show running Oct 17 -NOv 1st. Stover Mill is locates at 852 River Rd , Erwinna Pa. Opening reception is Oc 18th 1-5 PM. She will also have a piece in the signature Artist s at Noyes Museum in Stockton College. The museum hour Mon-Sat are 10 AM-4:30 PM, Sunday 12-3 PM. She will also be in The Art of Darkness paints the day of the dead of Freda Kahlo. 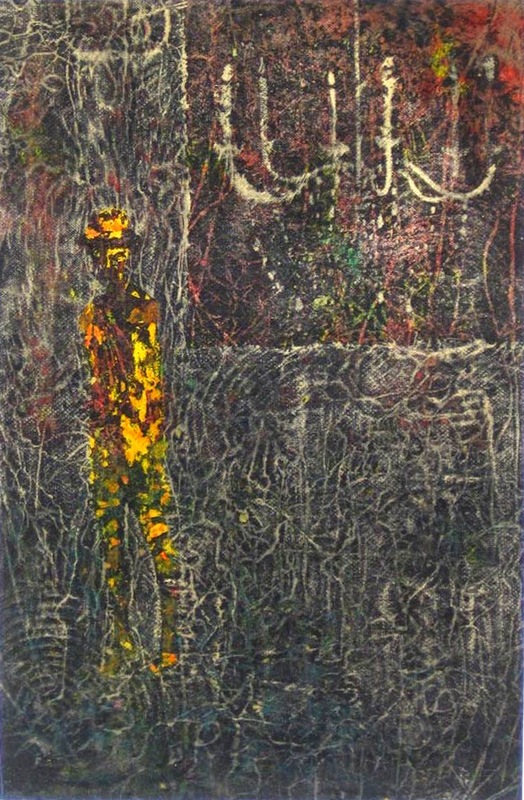 It will bo on view at the Everett alley, Trenton NJ. Gallery hours Weds-Fri 11-6 and Sat 11-4. Reception Oct 10th 6-8. It will also be on view at the Monster Ball on Oct 24th. 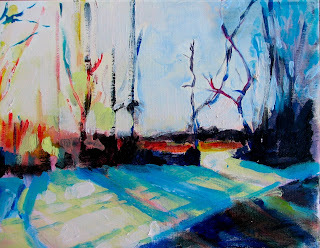 Finally Ellen will have a show of her small pastel pieces at the Twin Rivers Library. Opening October 5, 2015 5-6PM. The library is at 276 Abington Dr. East Windsor 08520. Come out to see and support Ellen. She is on fire! The Allentown Art Guild is pleased to have Karissa Harvey come and speak to the group on Sept 17, 2015. She will share with us what inspires her work. This should be a very interesting evening. 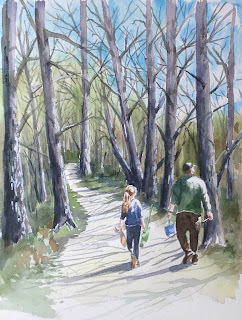 AAG member Tessie Field's watercolor piece will be part of the prestigious "Natures Beauty"show of the Garden State Watercolor Society's 46 Annual Juried Show. It is currently at the D & R Greenway Land Trust at the Johnson Education Center. Tessie's piece "Gone Fishing", seen below, will be in the show and has been featured on the website (http://www.drgreenway.org) and posters. The show runs through September 25, 2015. 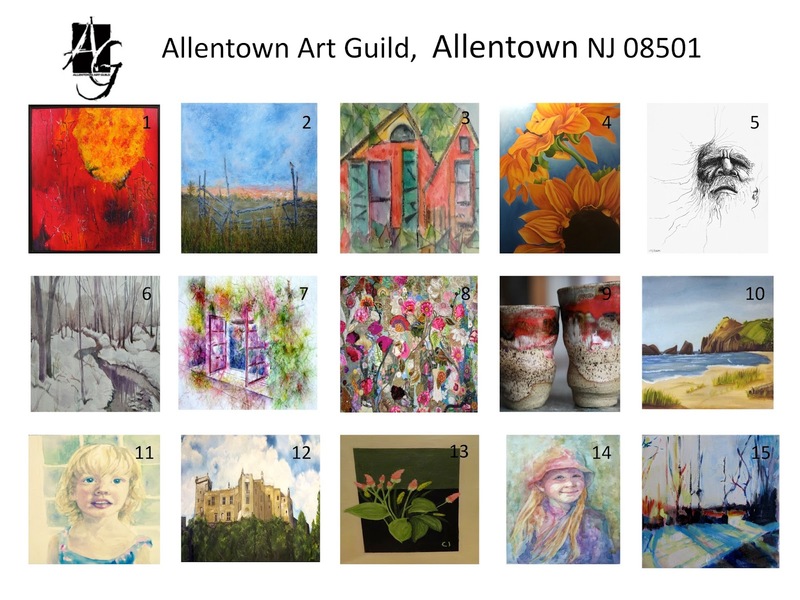 The gallery can be visited during weekdays 10AM -5 PM but it is suggested that you call first at 609-924-4646 to be sure the gallery is open. 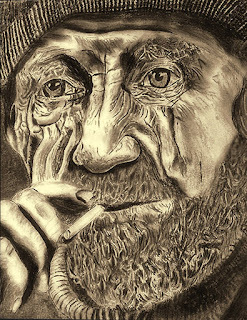 This is a beautiful gentle piece that is a pleasure to look at and inspires many about their own Gone Fishing Days! 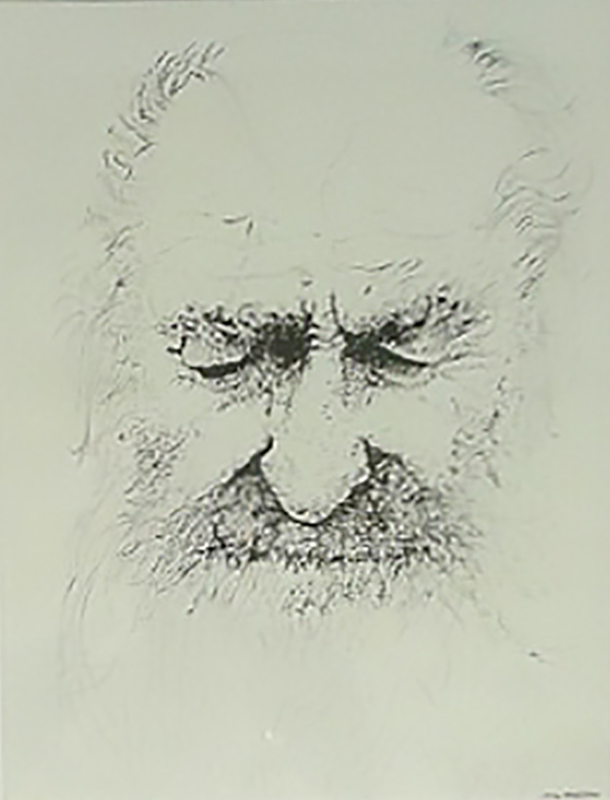 Terry Goldstein's pen and ink drawing "Stubborn Old Fool" took first place in works on paper at The 2015 Mercer County Senior Citizens Art Show. The Mercer County show is at Meadow Lakes Retirement Village, 300 Meadow Lakes, East Windsor NJ 08520. The Mercer county Show will run until August 12th. "Stubborn Old Fool" with the other first place winners from all of counties in the state will be back at Meadow Lakes for the 2015 State Final Show in October. Terry has a wide breadth of talent. 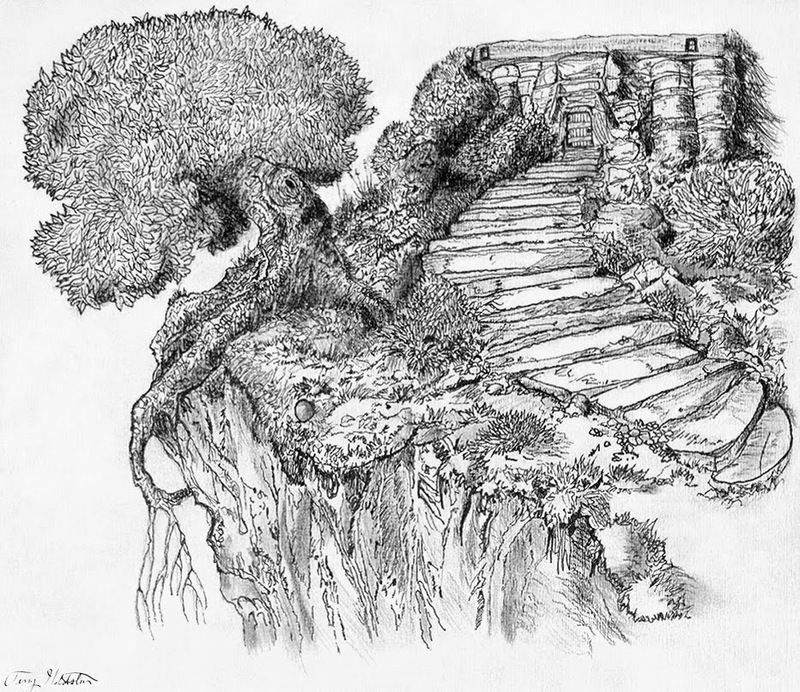 His pen and ink drawings are remarkable and memorable. Let's see how "Stubborn Old Fool" does in the state competition. We wish him well. It is a strong piece! Bring your lawn chairs, get a bite to eat and enjoy the music and art. Allentown is a great place to be! 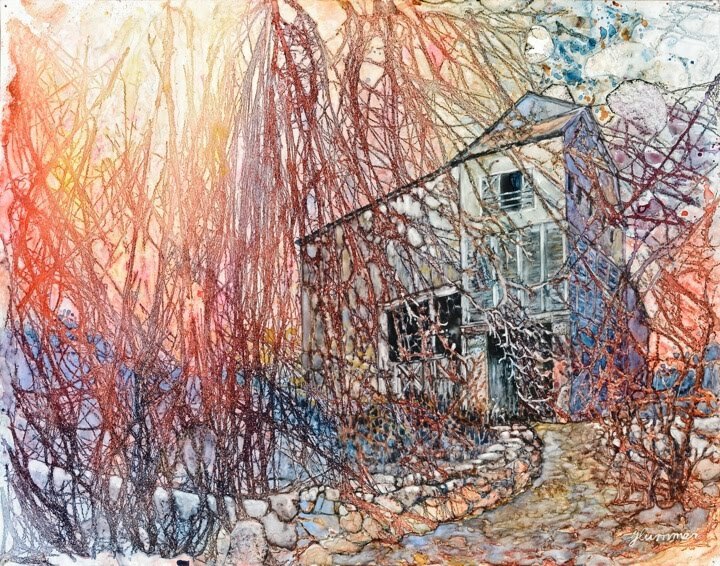 AAG member Karen Overbye will have a piece in the Grounds for Sculpture (GFS), Members Musing Group Show, July 11- August 23, 2015. This years juror for this show was Dejay B, Dukett, Associate Director & Associate Curator at the Arthur Ross Gallery at the University of Pennsylvania. The GFS is located at 126 Sculptors Way, Hamilton NJ 08619. The hours are: Tuesday- Thursday 10AM-6PM, Friday& Saturday 10AM-9PM, Sunday 10AM-6PM, closed on Monday. Karen's piece is entitled Uninvited. This is a clay print on Remy fabric. 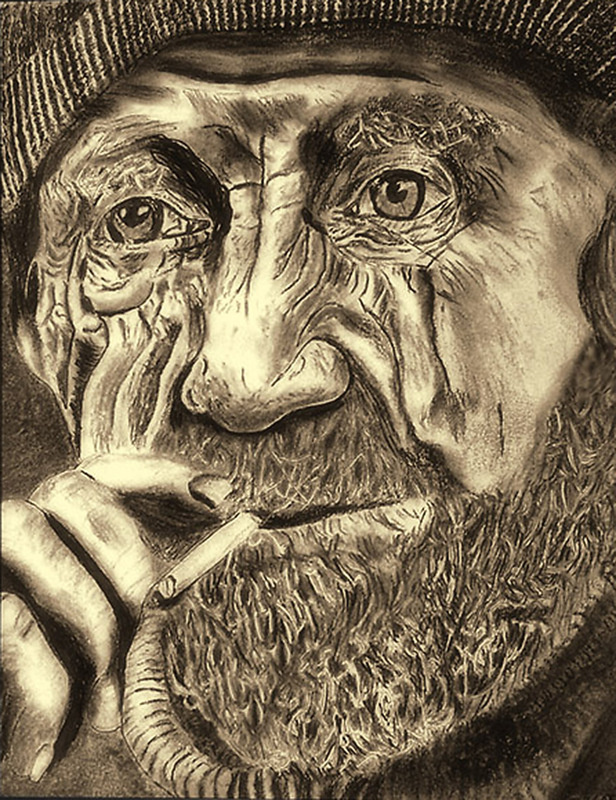 Uninvited took 1st place in Monmouth County and 2nd place in the State 2014 Senior Citizens Art Show in the professional print category. This is Karen's 5th time exhibiting at GFS. Report of Garden Club Tour by all participants. 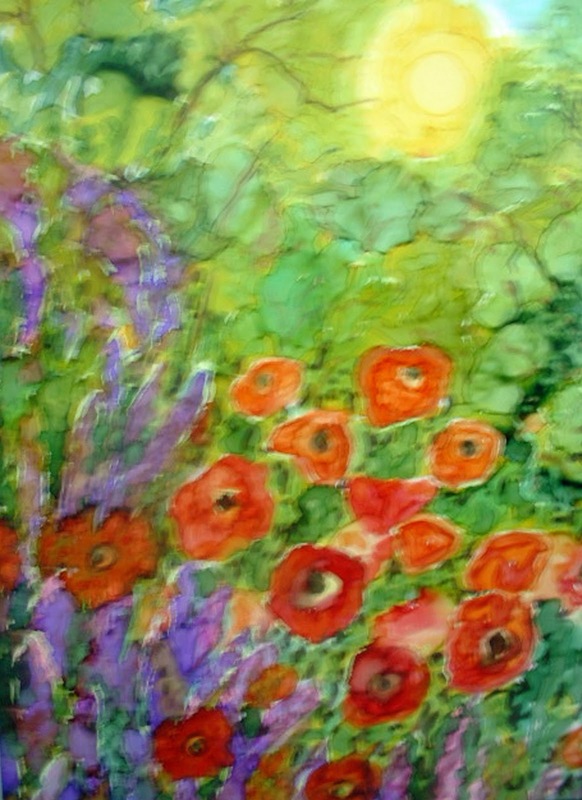 Ellen Baker was the recipient of Andree Lisette wonderful painting. Thank you Lisette for again donating one of your pieces for the tour. Nomination and voting for AGG Board members. Name, Title, Medium and Price must be on the back of each piece. A list of all pieces including: Name, Title, Medium and Price must be sent to Karen Overbye on Thursday June 25th so labels for the show can be made. Discussion of speakers and Guild activities for the upcoming year. The 2015 Hidden Garden Tour features a number of gardens in Allentown and the surrounding areas and it will include the art displays by Allentown Art Guild artists at work in the gardens. Attendees will also have the unique opportunity to shop for plants at Pleasant Run Nursery and purchase art by AAG members. On the day of the tour tickets can be purchased 8:30 AM- 12:30 PM for $20, at Kerris Tree Farm (Route 524). 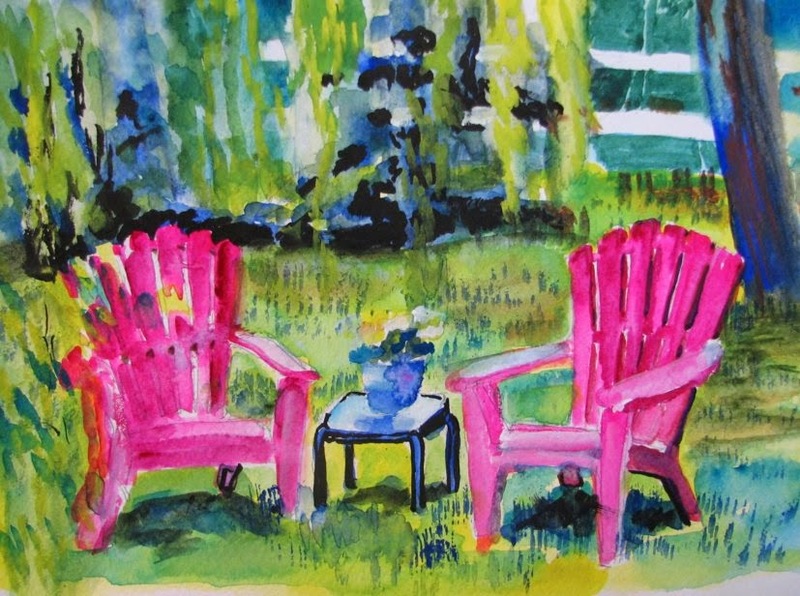 With the purchase of the garden tour comes a free chance to win a beautiful alcohol ink painting by AAG member Andree Lisette. Update: Ellen Baker from Trenton took home this lovely painting! 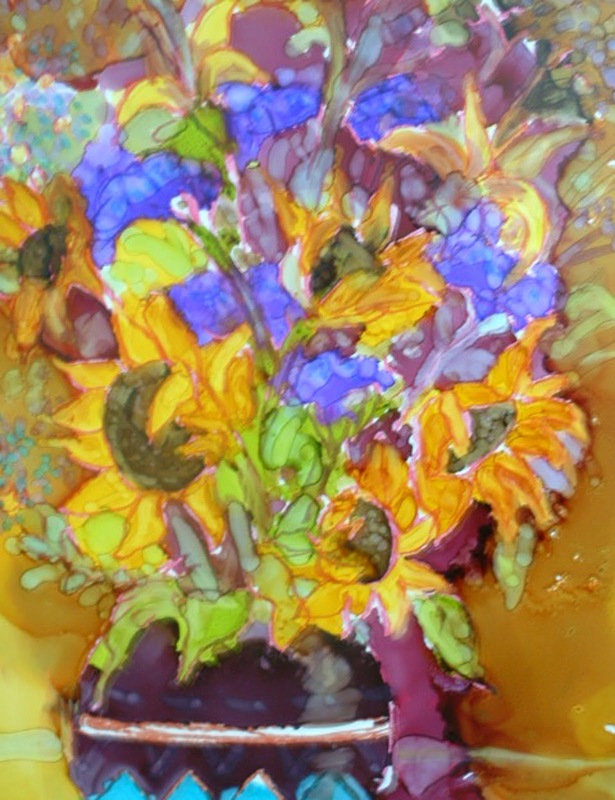 Tess Fields will also be giving a demonstration of alcohol inks on Yupo Paper Tuesday, June 16, from 2:30-3:30 at the Middletown Arts Center. Come out and enjoy the show. Karen and Lisette are having a joint show for the month of April. 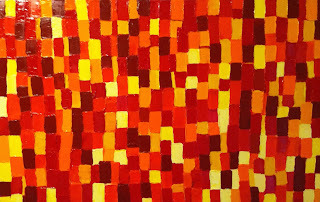 The show is entitled Assembled Realities at Ocean County Art Guild (http://www.ocartistguild.org) in Galleries 1and 2. 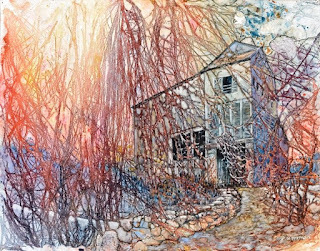 Their work is very different but it converges through texture, color and the desire to present their vision of the world. The opening of the show will be Sunday April 12, 2015 1-4 PM. The Guild is located at 22 Chesnut Ave, Island Heights NJ. The hours of the gallery are Tues- Sun 1-4PM. The Ocean County Guild is located in a beautiful Victorian that overlooks the mouth of Tom's River. Come and enjoy a nice afternoon. The AAG is a non-profit group of local adult artists that encourage each other and the arts in the community. 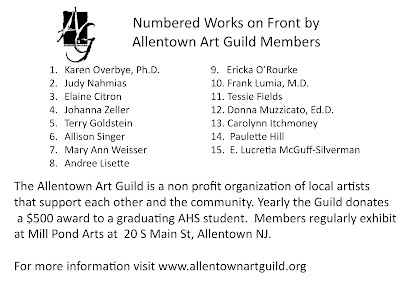 AAG yearly sponsors a $500 award to a graduating Allentown High School student. 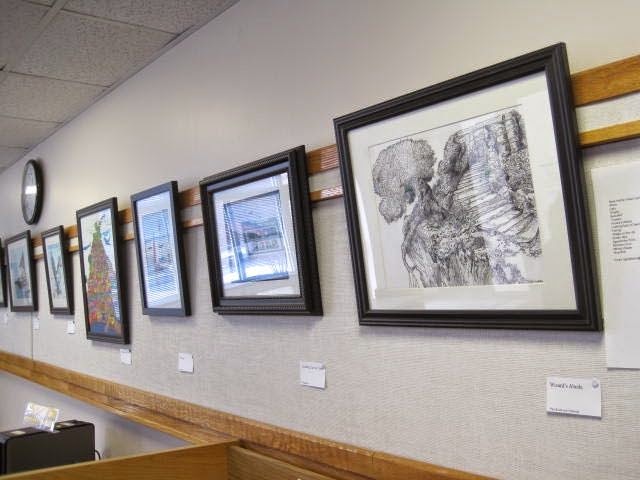 Stop in and visit the gallery. The paintings are changed every 3 to 4 months. The gallery is located on the walls in the entrance hall and the walls of the two main rooms on the first floor. The hours are 11 AM-7 PM Monday to Friday and Saturday 10AM- 3 PM. They are closed on Sunday. Guests are encourages to view the art even if students and teachers are present but please do not disrupt the lesson. ENJOY the ART. 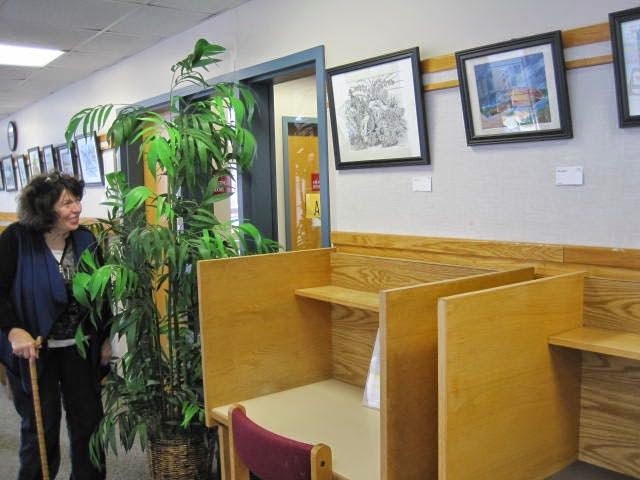 Terry Goldstein had his show in the Twin Rivers Library all of March 2015. Several members were enjoying his show last week. 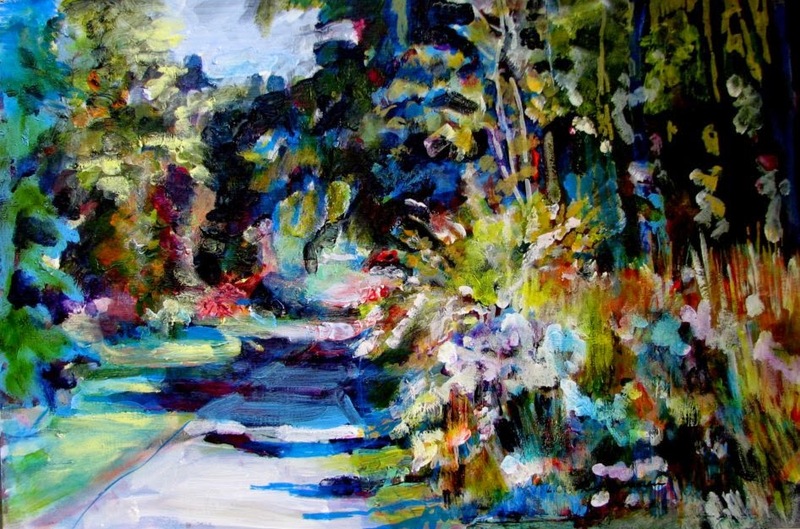 AAG member Judy Nahmias, a snow bird in Florida, continues to make her art there too. 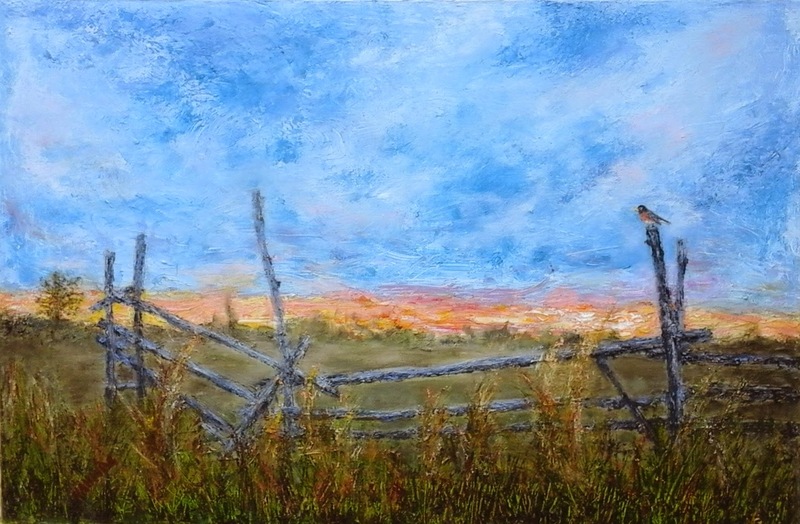 In March she was given honorable mention for her piece Sunset on the Farm, an oil painting on wooden board. The composition and color are wonderful! Chetna Singh M.D. 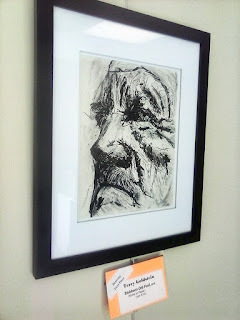 is exhibiting at the 14th annual Physicians Art and Photography Exhibit at The Jersey Shore University Medical Center. Chetna is known for her digital prints of her original art on silk. Her scarves are beautiful wearable art. She has 3 pieces in this show. Chetna is strongly committed to stopping violence against women. 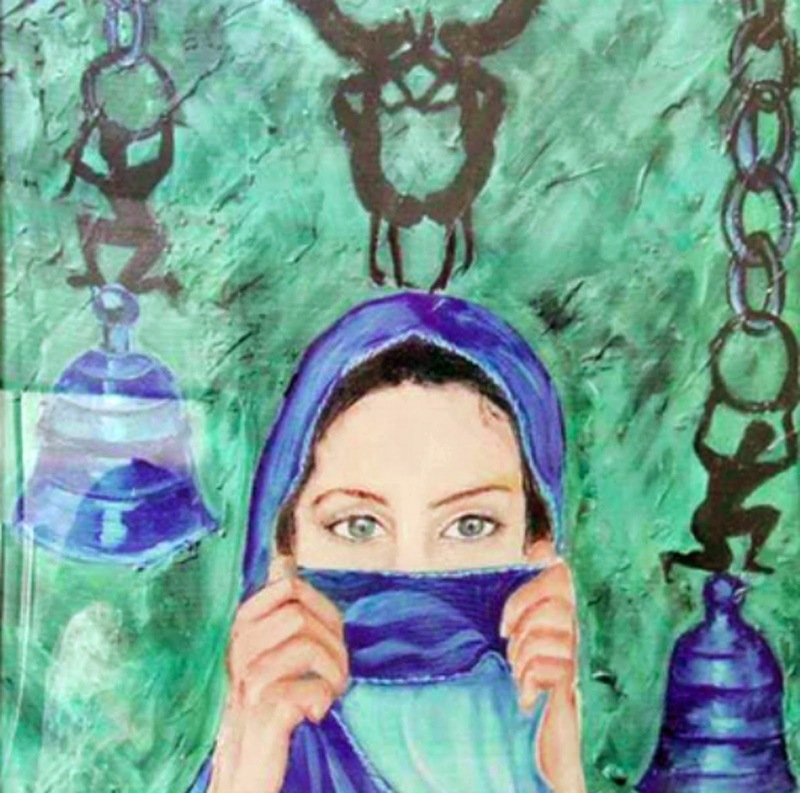 She supports the Ring the Bell initiative to make aware and help diffuse violent domestic situations. The opening was March 26th. 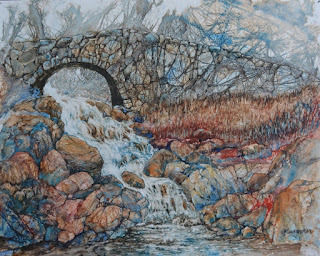 AAG member, Terry Goldstein is well know for his pen and ink, watercolor, photos and mixed media pieces. He has taken Best in Show in Mercer County and placed in many shows at Mercer County and State-Wide competitions. Terry will be having another one man show of his recent paintings at Twin River Library. The library is located at 276 Abbington Drive, East Windsor. The hours are: Mon-Thu, 9:30 AM-9 PM, Fri, Sat 9:30 AM- 5:00 Pm, Sun closed. Come and enjoy. The show is running February 12, 2015 through March 2015. AAG Member, Judy Nahmias was once again in the Villagers Newspaper in Florida. 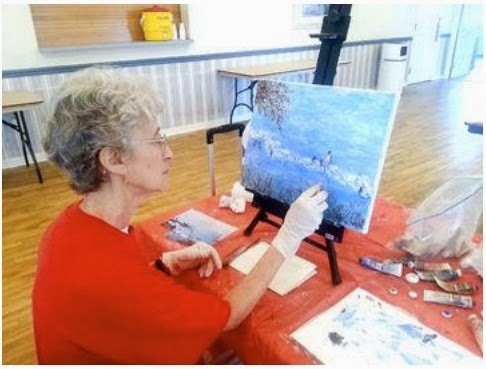 She was photographed doing one of her oil paintings. Judy is inspired by nature. She often works from photographs of things that inspire her. Judy, we always look forward to seeing your current works. L. Ellen McGuff Silverman will be in 3 different shows this month! 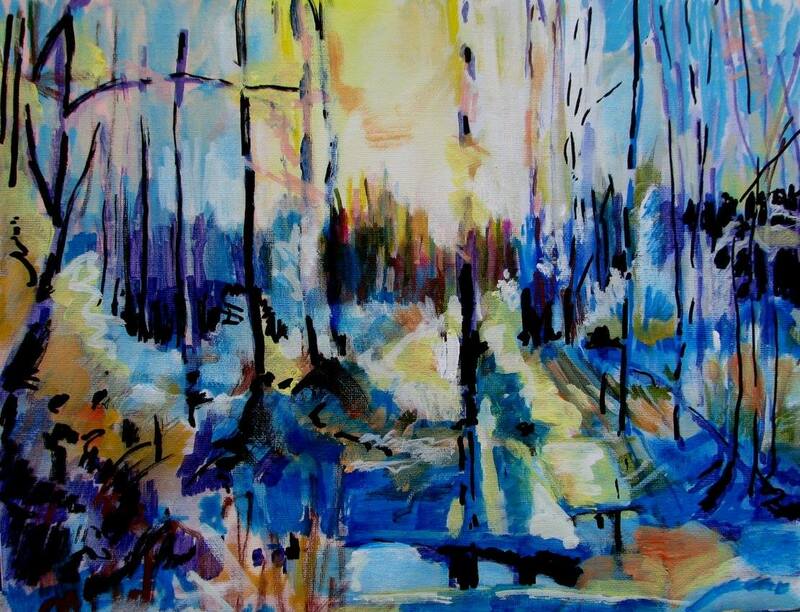 AAG member Ellen Silverman will be exhibiting at the Twin Rivers Library. The library is located at 279 Abbington Drive, East Windsor, NJ 08520. The exhibit will run Nov 1st-30th. The times that the library is open is M-Th 9:30AM- 9PM, Fri-Sat 9:30 AM- 5:00 PM. 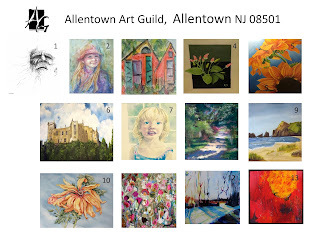 Ellen will also participate in Art All Day in Trenton on Nov 8the, 2014. 11 AM to 8 PM art works maps and gallery. At 12-5 PM Studio and Pop Up Gallery Tour. Ellen will be located at 247 East Front Street, Segal LaBate Commercail Real Estate Offices. 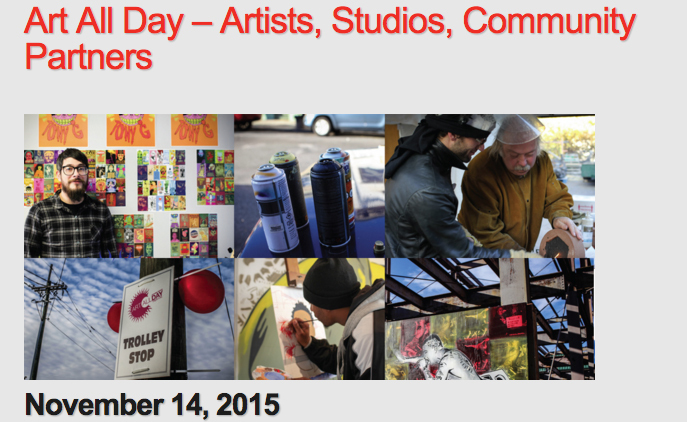 At 5 PM -8 PM there will be an Art All Day Reception. 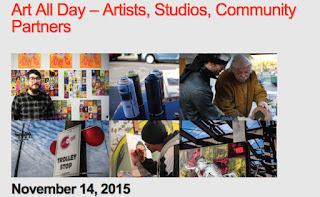 On Nov16th Ellen will be part of the Roosevelt Arts Project (RAP) Studio Tours. There will be a Mural Talk at 11AM in the gym of the Roosevelt Public School There will also be an Open Studio Tour 12 noon to 5 PM. Maps available at the Public School. This is a free event and the public is invited. 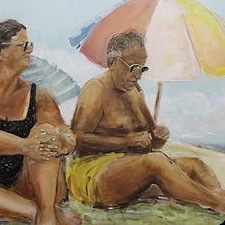 AAG member Karen Overbye took first place in the Monmouth County Senior Citizens Art Show. Her piece 'Uninvited 2" also called "Secret Lives" went onto the state wide competition and it took second place in the professional print category. The awards ceremony was November 30th at the Meadow Lakes Facility in Hightstown. Michael Ruane, the executive director of The County of Monmouth Department of Human Services Offices has invited Monmouth County members that placed in the state competition to be on exhibit in the Monmouth County Human Services Offices at 3000 Kozoloski Rd, Freehold NJ 07728. 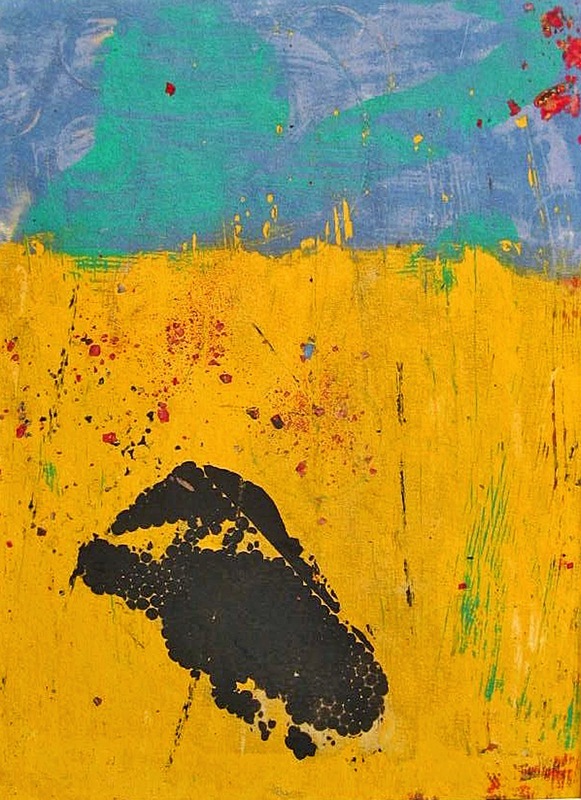 September 3 - 29, 2014 "A Sense of Place" Sole Show, The Grand Opera House, Mainstage Gallery, 818 N. Market St., Wilmington, DE 19801. Monday - Friday 10:00 AM - 4:30 PM and other times based on performance schedule. 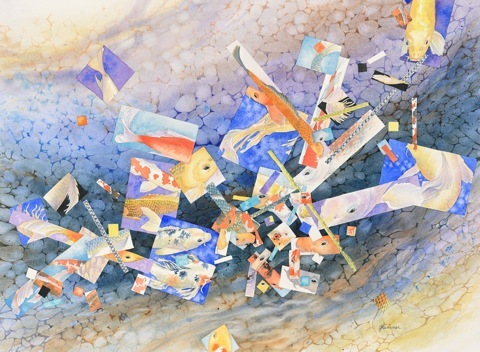 Opening September 5, 2014, 5:00 - 8:00 PM during Wilmington Art Loop. 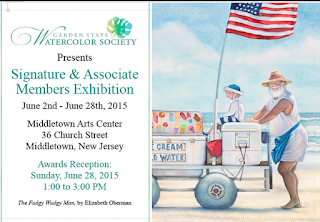 3 AAG members, Frank Lumia, Donna Muzzicato and Karen Overbye will be participating in the Monmouth County Senior Art Show. 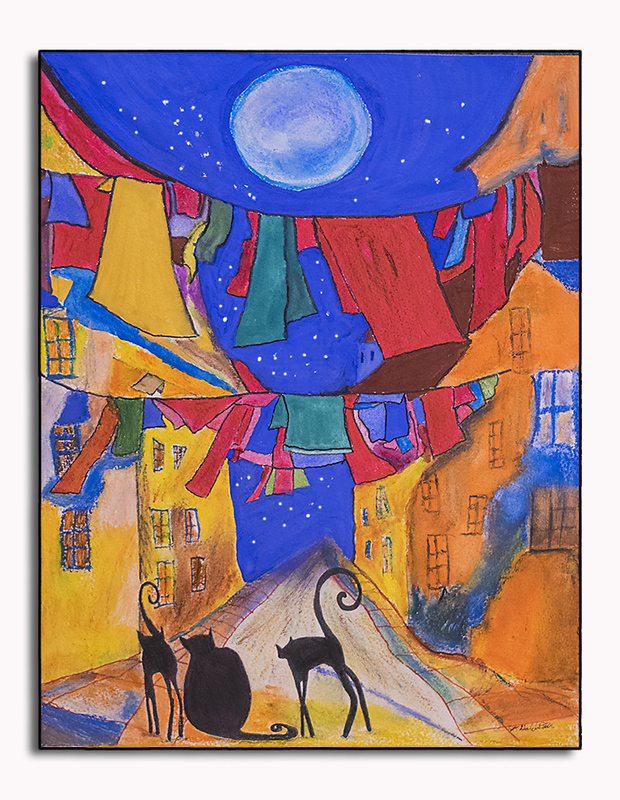 The show runs August 4th- August 28th at Monmouth County Library Headquarters at 125 Symmes Drive, Manalapan. The hours are Monday thru Thursday 9 AM-9 PM and Friday and Saturday 9 AM- 5 PM. 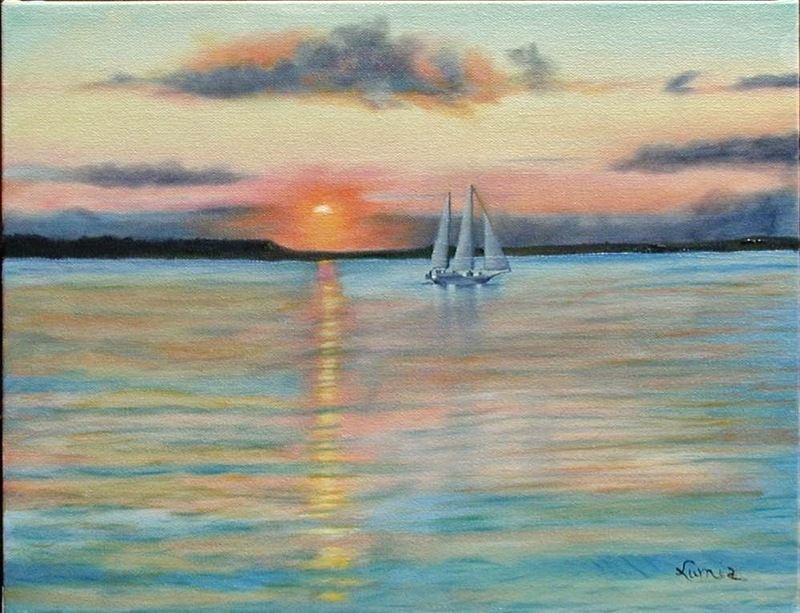 Frank Lumia's oil painting on canvas is entitled Hilton Head Island at Sunset. 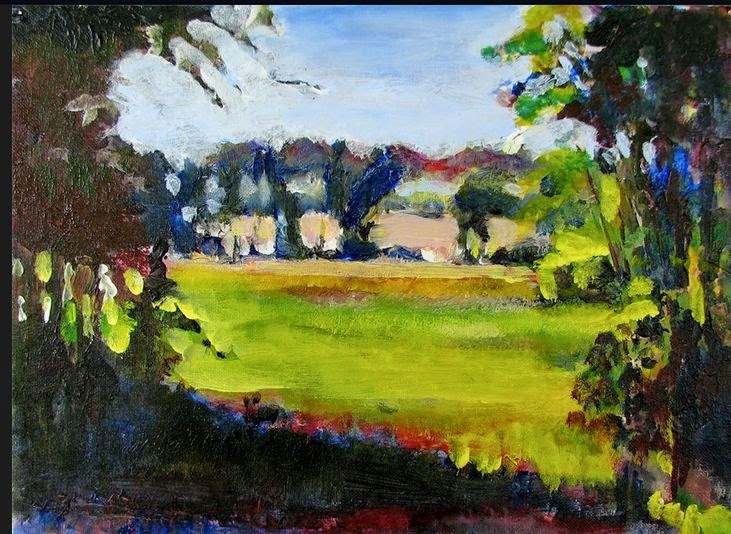 This painting took honorable mention in the 2014 Monmouth County Show. This is Franks second year in row to receive honorable mention. Donna Muzzicato's painting oil on canvas is entitled Baby Steps. 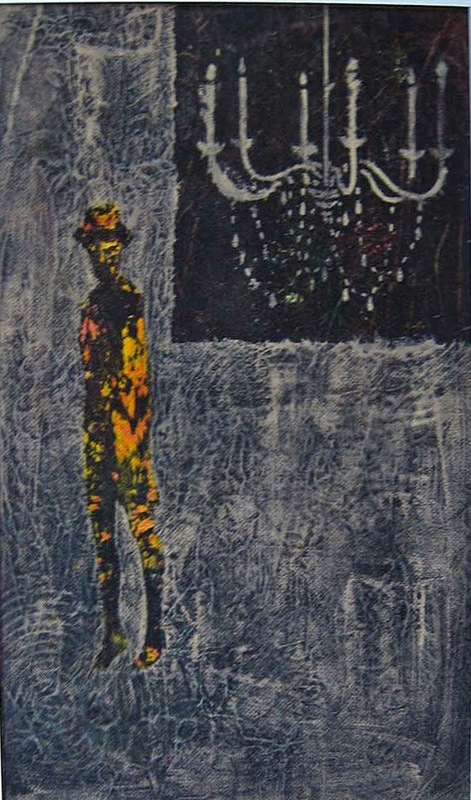 Karen Overbye's monoprint is entitled Uninvited II. Karen took first place in Monmouth County Professional Print category. 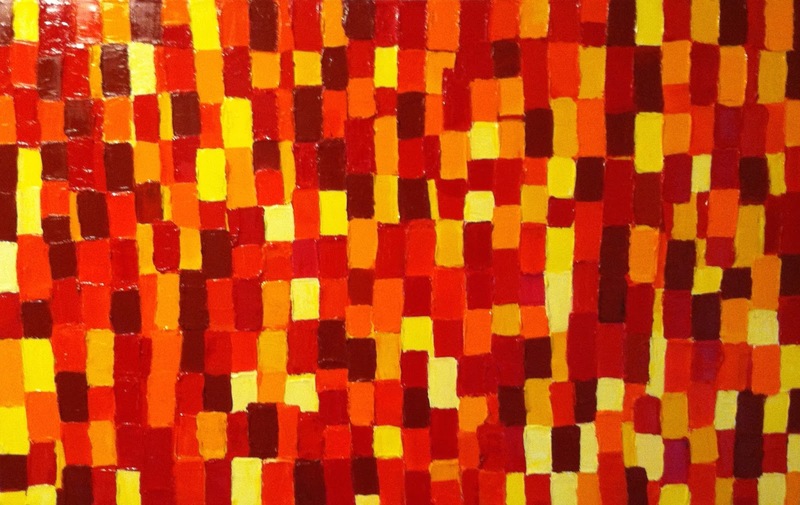 This piece will be hung at in the Monmouth Mall in Eatontown, Route 35 from September 1st to September 19th. Uninvited II will then be part of the State Competition and Exhibition that is open to the public at Meadow Lakes in Hightstown NJ September 25th to October 30th. Congrats to all. 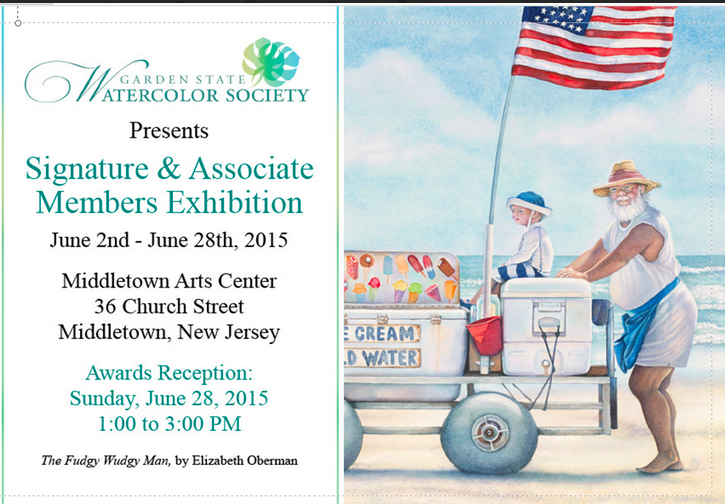 Come out and see what your fellow artists are doing in Monmouth County!